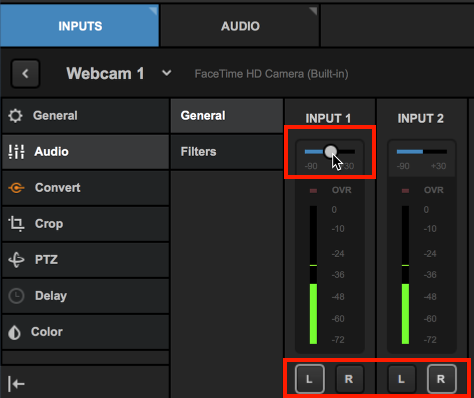 As of version 6, Studio's input settings now includes audio filters, allowing you to adjust and define the sound coming from each camera or audio source. Filters included are a Limiter, Compressor, Equalizer, and Noise Gate. To adjust an input's audio, navigate to the Inputs tab in the lower left corner. Select the gearwheel that corresponds to the source you wish to adjust. Select the Audio tab on the left side. Be sure to check the General tab to adjust your overall input audio levels first; a good rule of thumb is to set this so your audio peaks at around -4 decibels (dB), which you can do either by adjusting the gain above the audio input. You should also check the channels to which your audio source is outputting. For example, if you only have audio coming in through Input 1 (channel 1), be sure both the L and R buttons are selected so your viewers on headphones hear audio in both ears rather than one. This common with Studio One units. To adjust your audio further, select the Filters tab. One thing to note is that the default settings for each (i.e. if you enable all filters but don't adjust the settings any further) are best suited for speech audio, such as interviews, panel discussions, public meetings, etc. If you're in a noisier or more dynamic audio environment (e.g. concerts, recitals), you may want to adjust these further to get the desired sound. While we can provide guidelines for what each setting adjusts, best practice is always to test, listen, and adjust accordingly. There are four areas in which you can adjust your input's audio. Generally, it's best to start from the bottom, which deals with lower audio levels, and work your way up. The Noise Gate at the bottom of the menu deals with the quieter end of your audio. It's disabled by default so be sure to select the checkmark if you want to activate it. This is useful if you're in an environment that may have a lot of undesired background noise, such as an HVAC system. The default threshold is set to -40dB. When you go above this threshold, all sound will come through. However, when your main incoming audio drops below this, your background noise will be filtered out. For example, if a band is playing a song, presumably their audio would be well above -40dB, and so the Noise Gate would allow all sound to come through. When the band finishes their song, audio may drop below this threshold, and thus any faint background noise would also cut out. Above the Noise Gate is the Equalizer, which balances out different pitches and determines what pitches (or frequencies) should be louder than others. 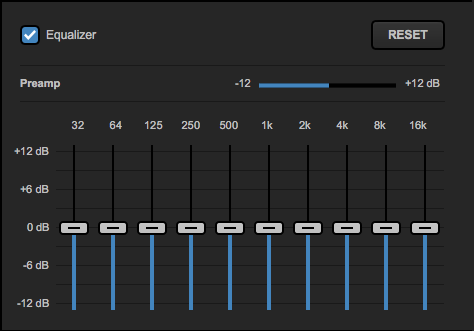 If you want to apply the Equalizer to your audio input, be sure to select the corresponding checkmark. Before adjusting the Preamp setting, take a look at the frequencies below it. Each slider represents a different sound frequency, with the lowest pitches being on the left and the highest on the right. By default, these are all balanced at 0 dB. If, for example, you notice that a deeper voice is coming in louder than a higher pitched voice when they should be equal, this is where you can fix that. If, after adjusting your frequencies, you notice that your overall sound is particularly loud or soft, this is where the Preamp comes into play. It defaults to 0 dB, but you can increase or decrease the average audio level the source outputs using this setting, allowing you to keep your frequencies balanced as desired, but ensuring this source still gets heard at the appropriate volume. The next setting up is the Compressor, which is not activated by default. If you wish to compress your louder audio, be sure to select the checkmark to enable it. 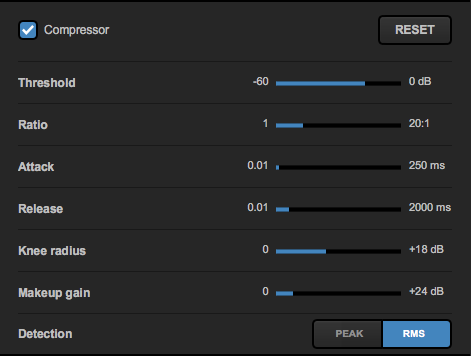 In short, the Compressor takes louder audio levels and reduces them to more normalized levels. This is primarily determined by the Threshold setting, which should be set to a lower decibel level than the threshold from the Limiter (discussed below). The Compressor's threshold establishes a dynamic range of audio, keeping most of your audio within a certain level. Any audio that comes in below this threshold will not be impacted by the Compressor (in other words, however it comes through the input is exactly how it will output). Sounds above this decibel level will be "compressed," or reduced to output at a lower level compared to how it comes in. 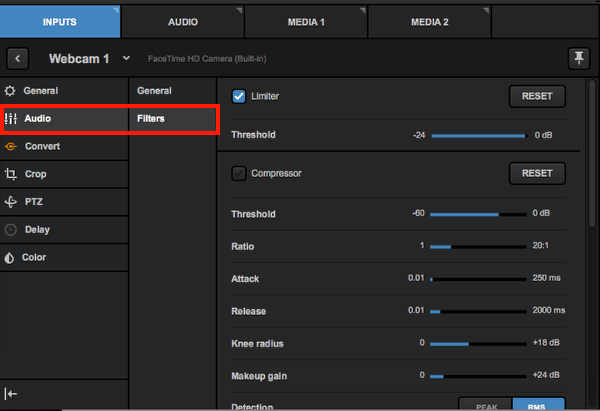 The rest of the settings in this filter determine how the Compressor behaves. Ratio: There is some math involved in this setting, but generally speaking this determines how dramatically audio above the threshold will be compressed, with the default setting set to a 5:1 ratio. For example, if an audio signal comes in 5dB above the threshold, then the Compressor will output that audio at 1dB above the configured threshold. If you imagine a straight, diagonal line graph, the threshold tells Studio at what point the line should bend, and the ratio will determine how far it bends down. Attack: How long (in milliseconds) the audio signal should be above the threshold before Studio applies the compression. If you set a longer attack time, then shorter spikes in audio will not be compressed. This is set to 4 ms by default. Release: Essentially the opposite of attack; this setting determines how long Studio should wait before uncompressing audio when it returns below the threshold. This is also set to 200ms by default, but note that the maximum release time available is higher than the attack setting. Knee radius: This measures how gradual the transition from uncompressed to compressed audio will be once your audio level goes past the threshold. A lower setting will make the transition more abrupt, whereas a higher setting will create a more smooth, gradual transition. Makeup gain: This is also sometimes referred to as "output gain." Oftentimes when compressing audio, it could end up compressing sound so much that it actually goes below the threshold and cause louder sounds to be quieter than their quieter counterparts. The makeup gain will bring that louder audio back up to where it should be in terms of volume. Detection: This determines how the Compressor detects audio peaks. Peak will recognize absolute peaks and be more responsive to short spikes in audio that go above the threshold. RMS (Root Mean Square) determines the average peak audio rather than brief spikes and thus is less responsive to short peaks. Finally at the top is the Limiter, which is enabled by default and is almost the opposite of the Noise Gate. The lone setting in this filter is the Threshold, which is typically set to a very high dB level, with the default setting being -1 dB. This helps prevent your audio from overmodulating should an extremely loud sound come through. Any audio that surpasses the threshold configured here will be filtered out, including any audio that is decreased through the Compressor but still reaches above this limit. If you are in a very quiet environment, you may consider lowering this beyond the default setting. If you adjust your audio so much that to the point where you want to start from scratch, each filter has a Reset button that places everything within that filter back to default settings.